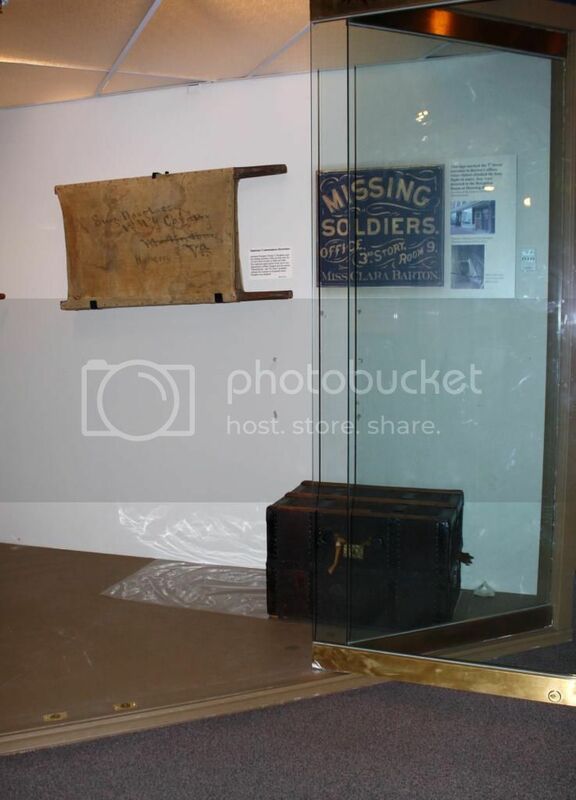 If you’ve been following my blog recently, you’ll probably remember that I’ve been working on putting together a display for the trunk bed of Clara Barton’s which is on loan to us from the American Red Cross. Though it took just a bit longer than expected, it is finally out on display! The case which housed the Clara Barton exhibit here at the NMCWM was too small for the trunk bed to be displayed open, so I had to do a little rearranging first. I had to switch the Barton display with our stretcher display, and put away one of the large stretchers for now. You can see that there’s plenty of room for the trunk in this case though. You can also see the sheet of Mylar I placed beneath the trunk to protect it. And here is the trunk bed folded out, complete with the poles and lines to support the mosquito netting. 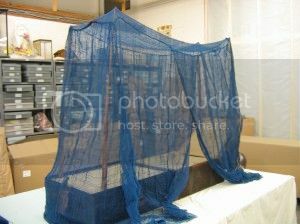 I had originally intended to display the bed with the mosquito netting around it. However, I had concerns about how much stress that would put on the fragile fabric. Though I could have supported the top with a layer of fabric or Mylar, the sides were more problematic. It also would have obstructed the view of the bed somewhat. So, I decided to display a piece of the netting draped across the end of the bed instead. 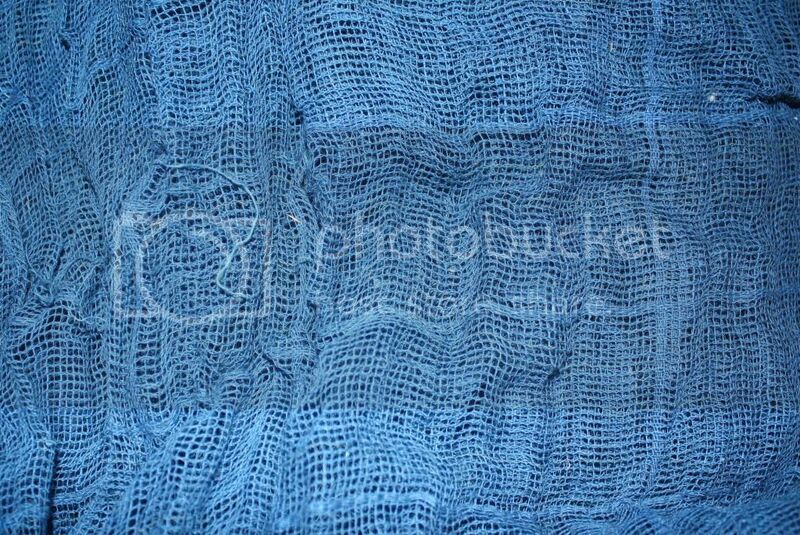 Here’s a close-up view of the mosquito netting which was found inside the trunk bed. Though it is in great shape for 150-year-old fabric, it is still prudent to treat it gently. 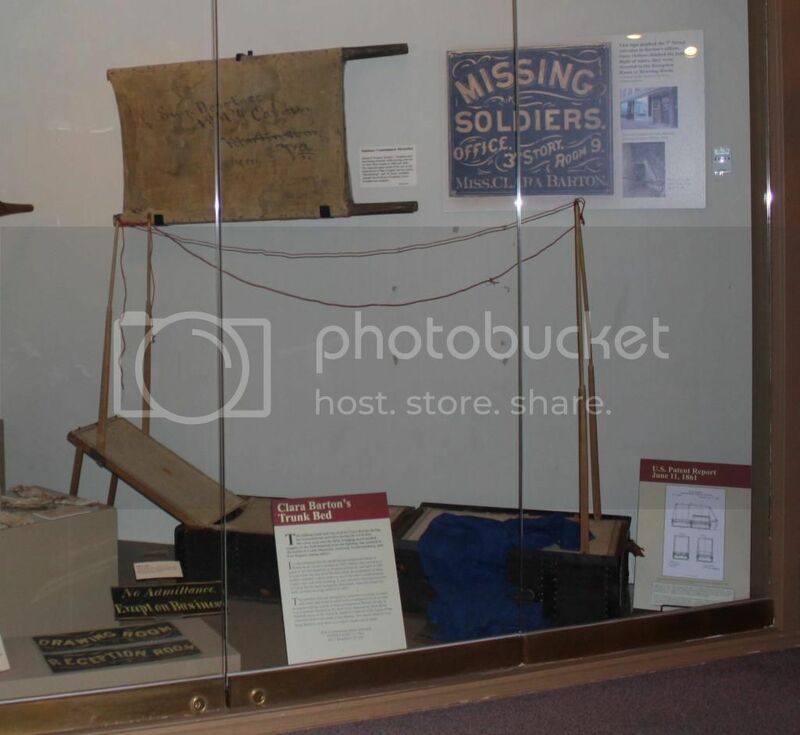 The trunk bed is displayed with some of the artifacts found at Clara Barton’s Missing Soldiers Office in Washington D.C., which are on loan to us from the U.S. General Services Administration. And just so that no one is disappointed about not seeing the bed set up with the mosquito netting, here is an image of that from the Red Cross! If you get the chance, come by and see it in person – the display will be here for at least a year. 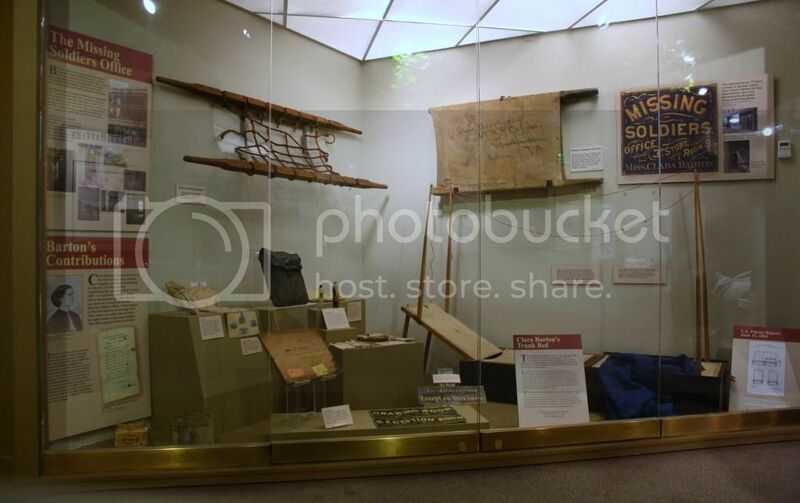 Photos courtesy of the National Museum of Civil War Medicine, except where otherwise noted. You can view my entire blog at www.guardianoftheartifacts.blogspot.com.